Made for precise and efficient slicing of meats, vegetables, and fruit, the santoku design developed in Japan but quickly became a Western favorite when introduced to chefs in American and Europe. Master blade smith Bob Kramer improved the classic design, introducing features with American techniques in mind. The Diamond Edge Pro knife and scissors sharpener from Smith Abrasives combines electric and manual sharpening systems for quick and accurate refurbishing of knives with standard European-style edge bevels. The machine also includes a manual hone for kitchen shears. 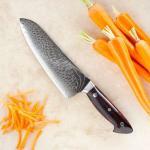 If you're the sort of chef who loves a beautiful knife but also wants a knife to use, you'll find them both in one knife when you buy the Shun Bob Kramer Pro paring knife. Beautiful enough to display, the Kramer Pro was also made for work. This simple bread slicer guide from Norpro gives home chefs a way to perfectly size bread slices for toast and sandwiches, but you'll need the right knife and a light touch. 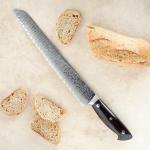 The Global G-9 Bread Knife's serrated edge slices cleanly through all types of bread and pastry. The hard CROMOVA-18 stainless steel edge lasts a long time but does require some special consideration if you want to keep that blade in top form. 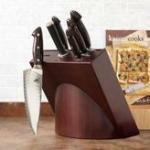 Anyone doing their own butchering needs a knife that holds up to hard work. This heavy butcher knife from Global blends advanced steel and all-stainless construction with a traditional butcher knife build. You'll find it to be the best of both worlds.